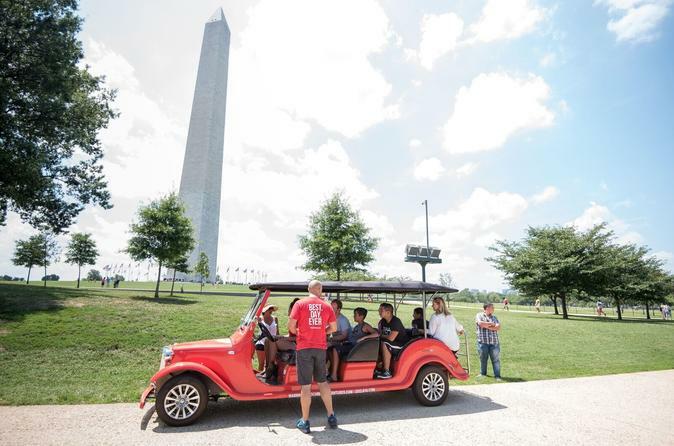 Join our small group tour of the National Mall on board our all-electric Red Roadster — perfect for covering the huge area and many monuments in DC! Next, join us as we travel through time and explore US history with a musical twist as we take you through the Smithsonian American History Museum. Ready to take on a fun-filled day on the National Mall? This total DC history tour combines two of our favorite tour experiences (Washington DC Unveiled and Museum of American History Through Music) into one exciting adventure. First, skip the crowded National Mall sidewalks and slide into our all-electric Red Roadsters to be guided around by a local. We’ll take you back to the city’s origins as we work our way to the beautiful Capitol Building and through the Smithsonian area. Next, we’ll breeze past the Washington Monument, Tidal Basin and Jefferson Memorial before stopping at the FDR, MLK and Lincoln memorials so you can hop out and explore on your own. Finally, we’ll take you past the famous White House before bringing you to the Smithsonian Museum of American History for the second leg of your journey through history. Your local guide will help you boogie your way through American history starting with the Star-Spangled Banner and the origins of the National Anthem before dancing you past some of the world’s most famous jazz, soul, salsa, and R&B tunes. You’ll explore the importance of music and the hidden messages in songs that were used in political movements and times of struggle and you may discover that you’ve accidentally transmitted a secret code every time you’ve whistled your favorite tune. Finally, you’ll end your American history journey by discovering how past rhythms and beats have made their way into nightclubs, bars, and onto the radio with the invention of electronic music equipment. As an added bonus — we’ll give you a chance to make a beat of your own! Who knows, maybe you’re America’s next top DJ!